Procurement professionals have long been hungry to improve their status in the enterprise - whether that means the creation of a CPO position or having increased access to C-suite decision makers. One investment all professionals, regardless of their current status, can make is in building up capabilities around supply market intelligence. In today's highly complex, matrix business environment, the better you understand the factors affecting demand, cost, risk, and quality both upstream and down, the more influence you can garner. In this webinar, Jon and I will take listeners through some of the key insights in our upcoming (November 2015) book and share our thoughts on the state of procurement today. 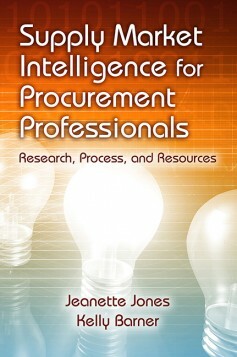 Yes, our book takes a close look at the field of procurement during a time of extraordinary transition. It also digs into topics such as changing professional demographics, technology, media coverage, public vs private sector procurement, and finance. More importantly, we discuss all of these topics without shying away from traditionally taboo subjects or points of view. On October 1st at 2pm EDT / 11am PDT, Jon and I will participate in a live, fast-paced Q&A hosted by Brittany Whitmore at Procurify. Click here to register and join us for what we expect will be a frank and thought-provoking discussion of the field of procurement and the people who work in it. 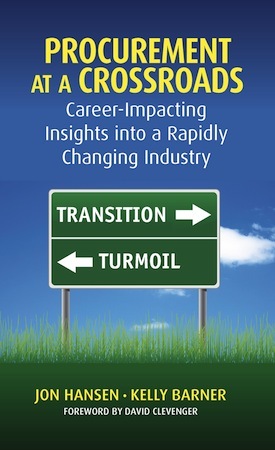 Jon Hansen and Kelly Barner are the co-authors of 'Procurement at a Crossroads: Career Impacting Insights into a Rapidly Changing Industry' (publishing in November 2015) which takes a close look at the field of procurement during a time of extraordinary transition. In the book, the authors identify nine key questions critical to those in the profession and then present multiple perspectives on each. The topics include changing professional demographics, technology, media coverage, public vs private sector, and finance without shying away from traditionally taboo subjects or points of view. In this webinar, the authors will review the nine questions and discuss what today's ambitious procurement professionals need to do to seize the opportunity represented by our current time of change. Once upon a time, working in IT was about technology: software, servers, updates, and end user hardware. The evolution of cloud technology and the advent of mobile devices has changed their role from one of implementing and administering technology to one of securing the technology being used. 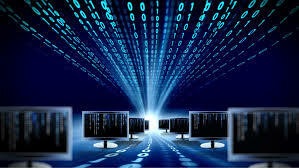 On one hand, IT has been freed from the server room; on the other, they are now faced with the ever-growing challenge of ensuring data and device security in a real-time world.